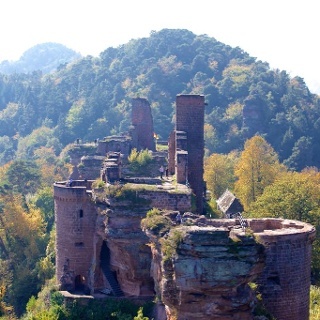 Photo:	Sonja Spiess, Südwestpfalz Touristik e.V. 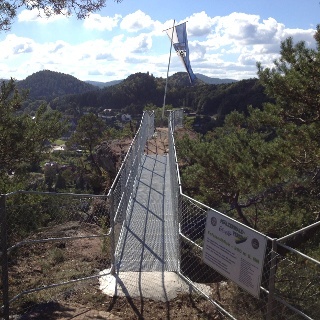 Exposed lookouts make the Busenberger Holzschuhpfad a special experience. 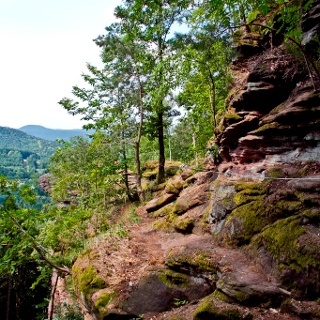 A visit to the mysterious Drachenfels castle ruins is one of the highlights of this hike. This is followed by idyllic passages through a meadow valley, to Sprinzelsfelsen and the Eichelberg to name just a few vantage points. Refreshments along the route: In the local garden in Bruchweiler-Bärenbach, Busenberg, Drachenfelshütte the PWV Busenberg (Wednesday and Sunday 11-19, Sun. 9-19 clock) all year round; except Christmas and New Year: Weisensteiner Hof, Mon. Fr. Rest day, Bühlhofschänke Mon. Thu.and Fr. Rest day, Ristorante Sardegna, Fr. Sa. u. Sun. from 18 clock. Attention: from now on, the upper castle of the castle ruin Drachenfels is closed until further notice. The lower castle is still freely accessible. From the "Hexenplätzel" at the sports ground in Busenberg, the path leads right into the forest. 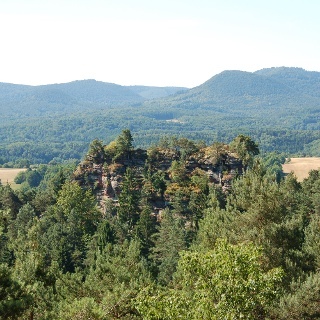 A loop around the Löffelsberg ends at a magnificent vantage point, looking far into the Wasgau. After a short climb we reach the next viewpoint. Following this there is a climb up to the Puhlstein (6 8 km), a veritable gallery of rock boulders that accompanies our adventurous path over the hill crest. in the middle of a marsh area is situated the legendary chapel of St. Gertraud (9,5 km), from where on you walk towards the "Drachenfelshütte" . 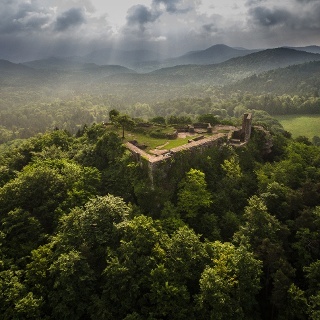 There is now a strenuous climb up to the 420 m high Heidenberg and the lookout point Schlüsselfels (11,8 km) from where you have a fantastic view of the Burg Berwartstein. 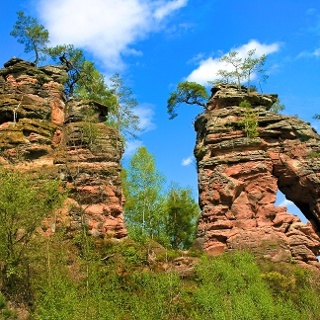 The forest tavern Drachenfelshütte and the mysterious castle ruins of the Drachenfels are the highlights of the middle point of this tour (13,8 km). We continue along the Busenberger Holzshuhpfad without losing even for a moment the view of the Burg Drachenfels. A swampy meadow valley guarantees a sunny passage before the next climb up to the lookout point Sprinzelsfelsen (21.0 km). Along the elongated rocky ridge hike on mystical paths, we encounter protruding rocky outcrops with gigantic views and eventually meet up in the valley with the B427, which we then have to cross. 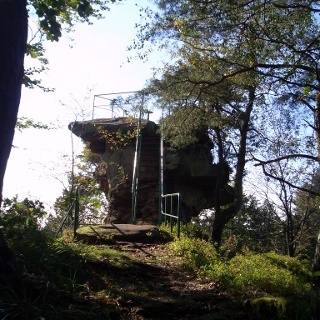 Along a large loop, it then goes on shady trails around the Eichelberg (24.0 km), where an exposed viewpoint of the Busenberg is again a welcome resting place. Past mighty rock barriers - on a beautiful hillside path – we finally get back to the Hexenplätzel in Busenberg. You take the train to Hinterweidenthal, from there by bus to Dahn and on to Busenberg. 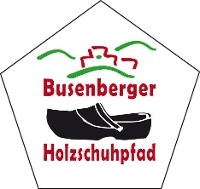 From May to October the excursion trains "Bundenthaler” and" Felsenland Express " run on Wednesdays, Saturdays, Sundays and public holidays from Mannheim / Karlsruhe to the stopping stations of Schindhard / Busenberg and then onto Busenberg using the RegioBus . Tolle aber auch sehr anstrengende Tour mit schönen Aussichtspunkten und abwechslungsreichen Wegen. Sind bei sonnigem Spätsommerwetter gestartet und haben mit vielen Fotopausen und einer Rast an der Drachenfelshütte 7 Stunden gebraucht. War eine schöne Tour, die aber - wie in den vorherigen Kommentaren gesagt - im zweiten Teil deutlich abflacht: z.T. Straßenlärm im Hintergrund und lange Stücke über breite Wald- oder Wiesenwege. Wer nicht so viel Zeit hat, kann hier gut abkürzen. Gut markierter Rundwanderwege auf höchstem Niveau, machen es zu einem besonderen Vergnügen, hier auf Entdeckertour zu gehen. Da laden grotesk geformte Buntsandsteinfelsen zum Staunen und Erkunden ein. Sehr schön zu Laufen, ein Highlight ist die Burg Drachenfels mit wunderschönem Rundumblick und tollen Gewölben die die Phantasie anregen. Auch die für die Region typischen aus dem Wald herausragenden Sandsteinbrocken die die Tour flankieren sind spannend..